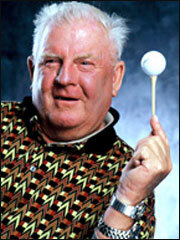 Natural Golf is a term that was originally named Right Way Golf by Jack Kuykendall back when he developed the system. Moe Norman, who had been considered by many of the most respected players around the world as the finest ball striker of all time had been playing with an almost identical swing to Jack's model for the better part of 4 decades. Jack Kuykendall, a retired physicist, developed the modern version of the Moe Norman swing without even knowing who Moe was. Natural Golf is often described as being an action as apposed to a swing. The legs are spread much wider apart and the arms and legs are nearly ramrod straight. Moe Norman, who came from a very low income family, didn't have the money to afford professional instruction as a youngster so he set out to teach himself the most repetitive way to strike a golf ball. He soon became one of the finest amateur players that Ontario and the rest of Canada had ever seen. After Jack and Moe met in 1991 they began giving clinics all over North America and the recognition that Moe Norman was deserving of finally started to come his way. Moe played briefly on the PGA tour in 1959. Due to his excruciating shy personality he vanished from the Tour long before his talent really shone through. 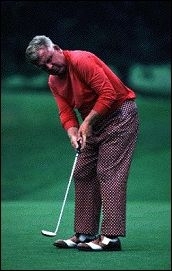 Lee Trevino stated , "He's the best ball-striker I ever saw come down the pipe. I didn't see them all, but I don't know how anyone could hit the ball better than Moe Norman. " Tiger Woods told one of Golf Digest's writers Jamie Diaz in January of 2005 that there have only been two golfers in history that "owned their swing": Moe Norman and Ben Hogan. Tiger followed up by saying, "I want to own mine." Titleist, announced that the company would pay Moe $5,000 a month for the rest of his life. This was truly a gesture of kindheartedness as Titleist had no commercial plans for Moe. He was also inducted into the Canadian Hall of Fame on February 20, 1995. Moe passed away on September 4, 2004 at the age of 75 in a hospital in Kitchener Ontario from congestive heart failure. Moe had been suffering with poor health since he had had bypass surgery six years prior. His legacy will live on through the professionals that are now teaching what has become known as a simpler way to play the game. The quirky Canadian will be dearly missed by all that knew him. *Won the Canadian PGA Seniors Championship every year from 1979 to 1985 and then again in 1987.